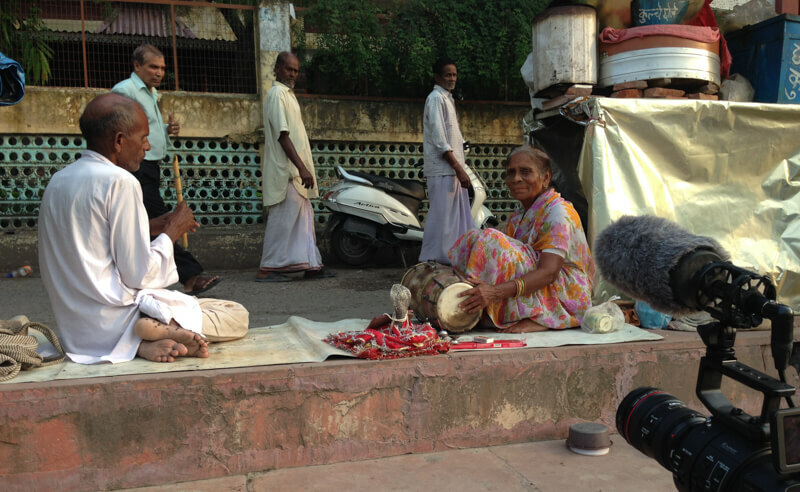 I’m sitting cross-legged in a small Ashram with about 20 other people – mainly Westerners. We’re awaiting the arrival of Swami G – the spiritual leader of this small Ashram – to lead a meditation class and Dharma. The room is warm with the cloying scent of incense thick in the air. Even though I showered just before leaving the guesthouse, I’m sticky from the humidity already; a trickle of sweat is rolling down the back of my neck. In a bustle of orange and saffron robes, Swami G enters the room and takes a seat facing us. He looks and sounds like Eckhart Tolle and radiates a cool, earthy vibe (despite his Indian moniker, Swami G is a transplanted Belgian). His Dharma teaching is about the importance and challenge of staying present; about practicing wherever you are mentally, emotionally or physically – regardless of where you think you want to be. Given how tired I am from the last 6 weeks of this expedition, it feels like an apropos reminder. 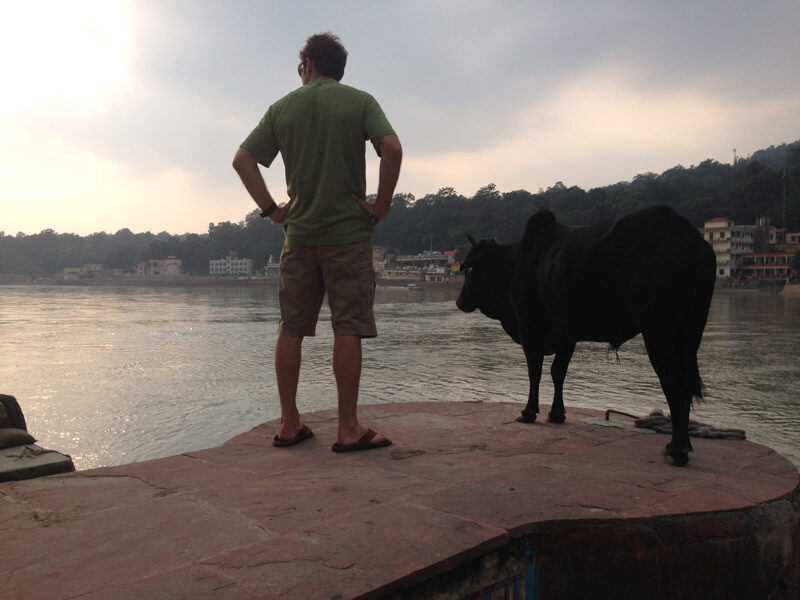 People have found spiritual sustenance in Rishikesh for centuries; turns out I’m one of them too. Rishikesh is a small city of about 100,000 or so residents in the Himalayan foothills of northern India, in the district of Dehradun. Today, it’s considered the gateway to the Garwhal Himalayas and sits in the relatively new state of Uttarakhand (originally called Uttaranchal); the two historical regions of Kumaon and Garwhal having successfully rallied for secession from the (now) neighboring state of Uttar Pradesh in 2000. Despite the crazy quilt of political history and border reassignments, a few things are immutable about Rishikesh – it’s always been famously nestled on the banks of India’s most sacred river, the Ganges, and it’s always been a magnet for spiritual pilgrims of one flavor or another. We rolled into town about 9 days ago – dirty, grimy, and sweaty – having just ridden for days on rough mountain roads from Ladakh, racing falling snow lines over the world’s highest mountain passes, through the Spiti Valley, and down to the bustle of Rishikesh. Though we’re still relatively north in the Indian subcontinent, the heat and humidity is intense compared to the dry air of the Tibetan plateau where we’ve been filming for 4 weeks. The chaotic energy, noise, and people are also jarring after the remoteness of Ladakh. Hindus have long considered this a holy city, the Lord Rama having served penance here for killing the Demon King. Hindu pilgrims have been coming to Rishikesh (as well as the much more visited Varanasi and Hradiwar) for 2000 years to performsacred rituals in the holy waters of the Ganges; purifying themselves and releasing the dead into her waters. By all accounts, Rishikesh was a sleepy little slice of paradise on the river about 40 years ago. Nothing here but Hindu pilgrims and simple ashrams for spiritual seekers in retreat from earthly temptations. And then the absurd happened in 1968. At the invitation of the Maharishi Yogi, the most famous rock band on the planet (along with an entourage of wives, girlfriends, and movie stars) descended on Rishikesh to experiment with transcendental meditation – among other more illicit things – and well… there went the neighborhood, as they say. 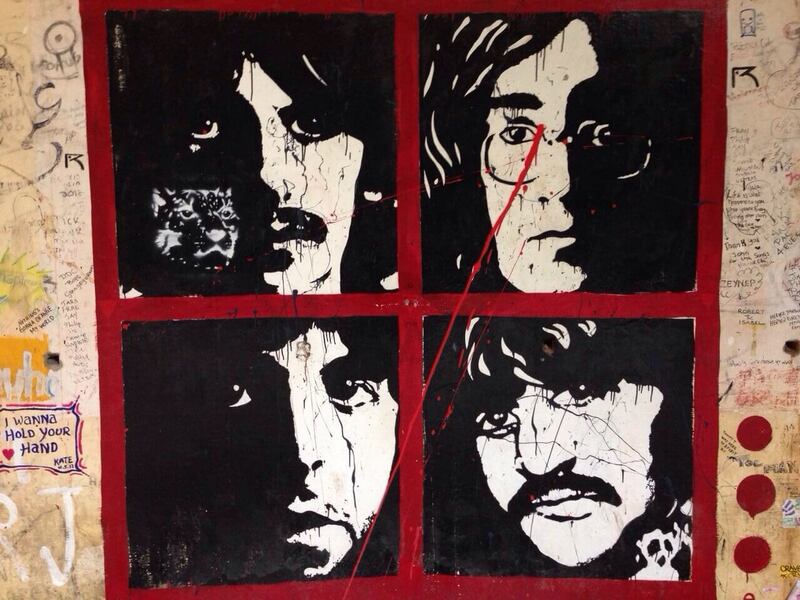 Though the jungle has now reclaimed the famous “Beatles ashram” and it sits behind locked iron gates, the band’s visit here inspired scores of others to begin coming to Rishikesh… and the city’s steadily grown since then. There are several areas to the city – the city proper (where most of the 100,000 residents live), and the distinctly tourist-oriented areas north of the city along the Ganga, between the striking Laxman Jhula and Ram Jhula bridges. Here are the temples, ashrams, yoga centers, cyber cafes, restaurants and coffee shops. You can’t spit without hitting a sign for yoga classes. There is even one ashram – the Parmarth Niketan – with 1,000 rooms. (It’s apparently very popular with Westerners). 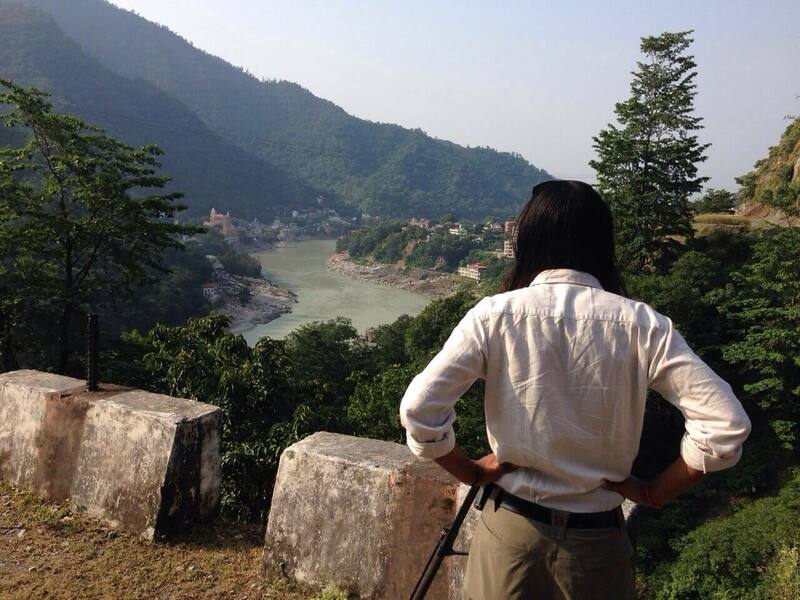 In visiting Rishikesh for our film expedition, we initially planned to explore how Rishikesh embodies the paradox between the sacred and the profane – and how this historical spiritual gathering place is impacted by its increasing popularity as a modern tourist destination. We were really interested in exploring the “cost of enlightenment”- a behind-the-scenes story about how the growth of religious tourism is putting great pressure on a once pristine spiritual sanctuary. 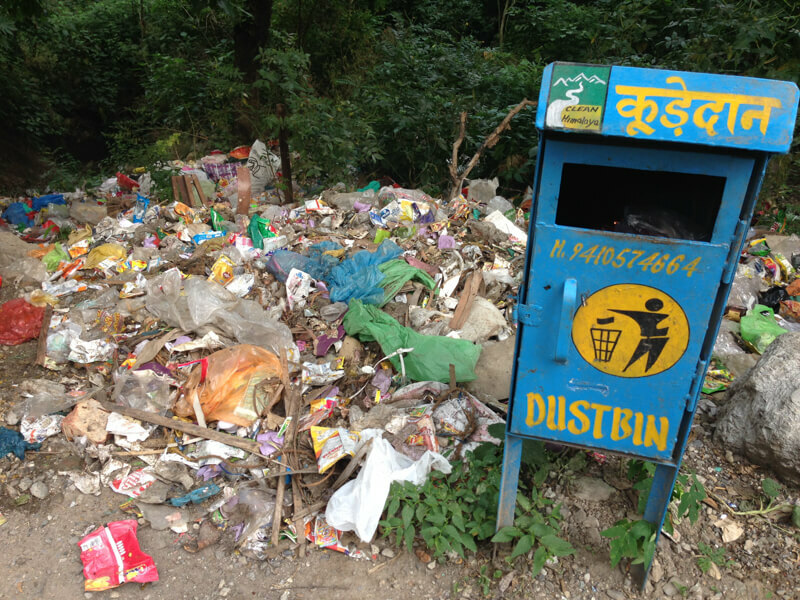 We wanted to look into the unintended consequences of commercialized enlightenment in Rishikesh, so-to-speak – the increased pollution, waste, construction, etc. What we actually discovered is different – and surprising. Yes, Rishikesh is experiencing real growth pains. Garbage and waste ARE a huge problem. The sacred Ganges is now one of the most polluted rivers in India. The city’s infrastructure is limited at best and, by Western standards, an utter mess. Today, Rishikesh sees between 600,000 to 800,000 tourists a year. Though this is dwarfed by the almost 9 million visitors per year who flock to nearby Haridwar to bathe in the Ganga, walking around Rishikesh, I’m still baffled by how over half a million people could possibly visit this place every year. There are only 64 registered lodging choices according to the last census, and I can tell you from experience, there aren’t enough bathroom facilities for a busload of tourists in some parts of town – much less half a million of them. Unexpectedly, we find that these infrastructure pressures – and the race to deal with them – are not due to foreign tourists. Instead, they’re due to the exploding growth of India’s middle class. Negative impact from foreign tourism pales in contrast to what’s happening from domestic tourism. India’s middle class is skyrocketing. In 1996, economists estimated there were only 25 million people in this category. In 2013, this demographic had grown to over 160 million. By next year – 2015 – economists estimate India’s middle class will have grown by a mind-blowing 42% in two years to over 276 million people. Discretionary spending by India’s middle class is expected to represent 70% of all of India’s spending by 2025, making it the world’s fifth-largest consumer economy. On the whole, India’s growing middle class is educated, wired, connected, and plugged into social media. En masse, they will be an unstoppable juggernaut influencing the economic, environmental, and social future of India. With a booming economy, a modern outlook, and the desire to travel – the new generation is on the move. In Swami G’s meditation class, we were mostly white and Western. Now I realize where all the Indians were….they were out having a good time! 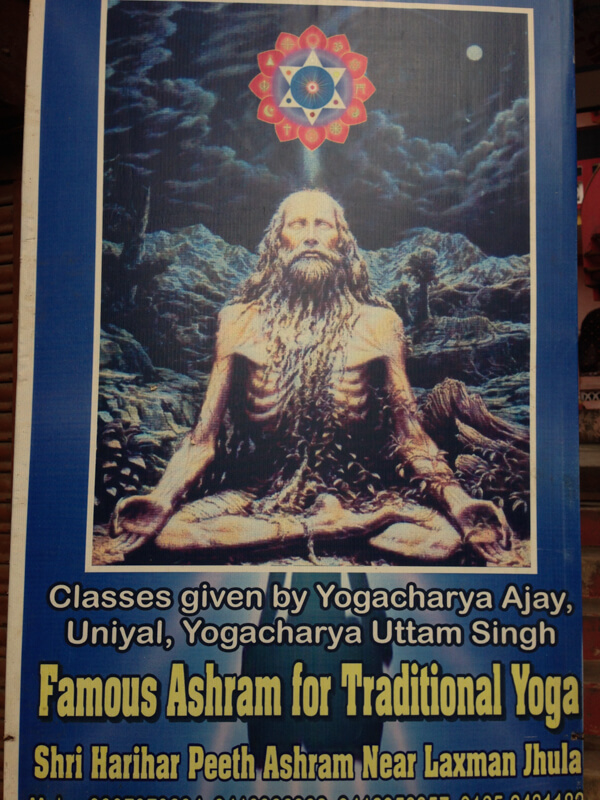 Whereas older generations came to Rishikesh to meditate or do yoga – this generation comes to play. With convenient access from Delhi by car, train or plane, Indian tourists are flocking here in droves to raft the Ganges, hike the national forest, bungee jump, zipline, and camp. In fact, Rishikesh has started billing itself to Indians as the “Adventure Capital of India”. 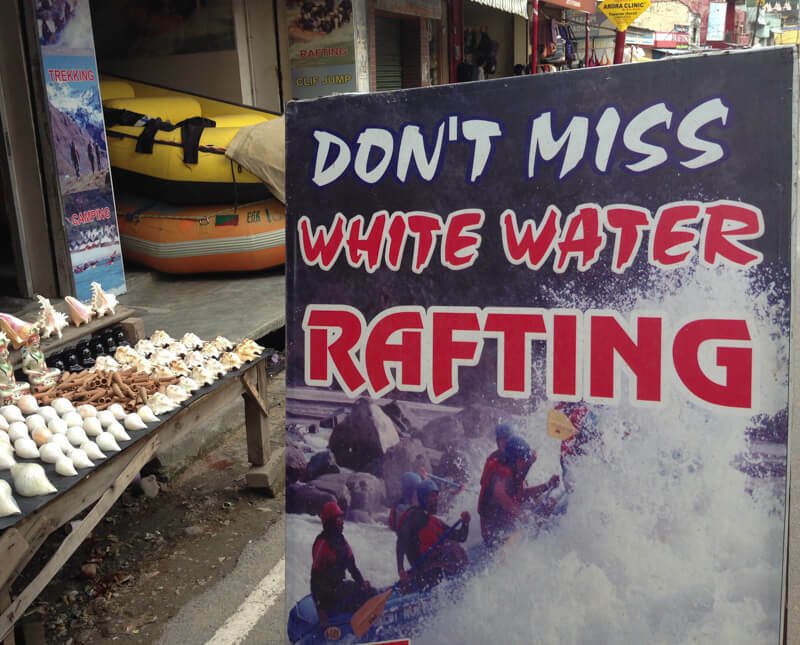 I was stunned to discover there were over 160 rafting companies in Rishikesh alone! They’re each running multiple trips per day and there are enough tourists to go around. The city’s popularity as a “must see” place to visit has led to new construction – lots of it. Vacation condos are sprouting like mushrooms (albeit slow-growing ones since we’re still talking rural India construction practices here). 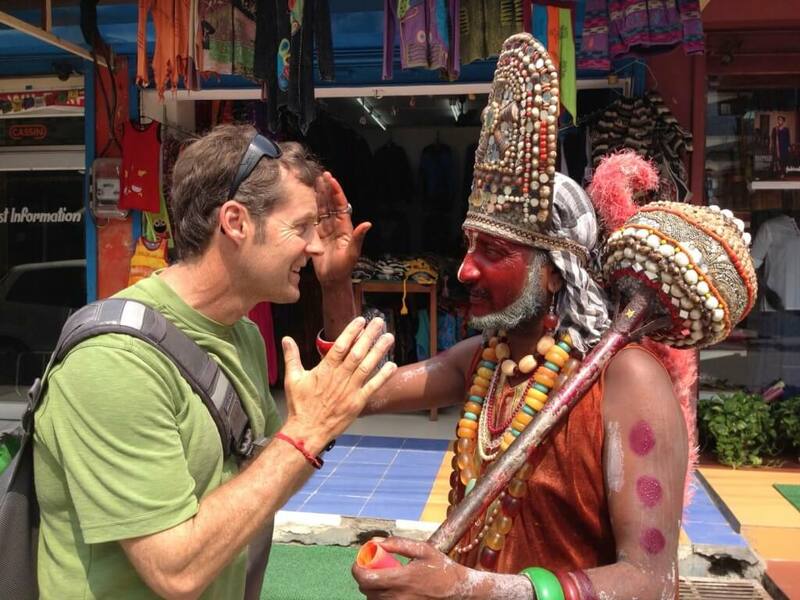 The scale and impact of this rapidly growing tourist industry is incredible… and challenging. Observing all this first-hand makes it undeniable how devastating and permanent the damage will be here, not to mention in other easily accessible areas of the Himalayas. You might draw parallels to the crisis of Great Britain’s industrial revolution when breathing London smog became an extreme health risk, or America’s pre-EPA era, when lack of environmental protection allowed unchecked industrial waste to poison communities and rivers could literally burn. From inadequate toilet facilities to trash collection to sewage in the Ganges, Rishikesh is struggling. Adventure tourism has grown so rapidly that the industry is virtually unregulated. Safety standards are non-existent; drownings are relatively common-place with seemingly no consequences for operators. Price wars between the glut of operators have lowered the quality of experiences. For me, as a professional in this industry – it seems like chaos. Yet…it’s India. In a mad way, it all manages to keep rolling and the busloads keep coming. You can hear the Indian rafters whooping and hollering through the waves just as you do American rafters on the rivers of Idaho or Oregon. With my Western attitude and expectations, it’s more than a bit frustrating and grim. I admit I catch myself feeling judgmental. How could anyone accept living in this chaos, this uncleanliness and filth? What does it take to shift into conscious living? Is it inevitable that humanity must hit a rock bottom before we’re willing to make a change? Doesn’t anyone here actually care? I keep thinking about the staggering statistic that 700 million people in India lack toilets (that’s more than double the number of people living in the US, period). These numbers boggle the mind and seem made up somehow, until you visit here and then.. it all seems plausible. Luckily, I’ve also spent time this week talking with some locals – both indigenous and transplanted – who’ve been working on the bleeding edge of social change in Rishikesh for some time. They remind me a little of battle-hardened combat soldiers. There’s no hippie-optimism, kum-bai-yah vibe about them; they know the issues, the facts, and the challenges. Collectively, these social change agents don’t see eye-to-eye on everything…but they soldier on because they know what’s at stake…the future. They work to clean the environment, educate the children no one else will touch, protect the Ganges, and build local capacity for sustainable projects. They embody a fierce and desperate optimism that what they’re doing will matter, which I guess is the definition of hope. At the end of the hour-long clean up, the garbage is sorted and recyclable material sold to the local vendor. It feels like a drop in the ocean compared with the overall problem… but for the volunteers who show up every day to pick up garbage, it’s an important source of hope and a statement about personal action that I – and they – want to believe will make a difference in the end.